This is the Submission Topic. The Discussion Topic is here. This week's theme comes from nobravery whose "Paradox" was the winner of our Soul Cah Toa competition! 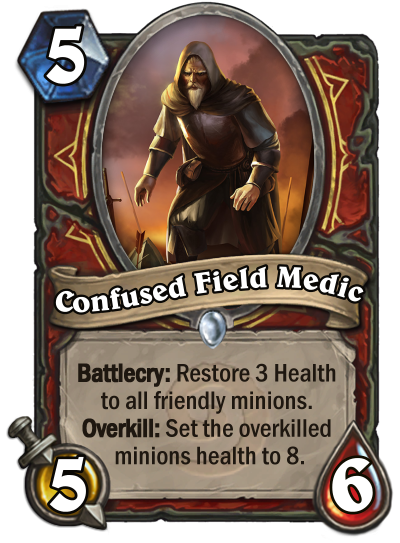 You must design two cards from different classes with the exact same text. 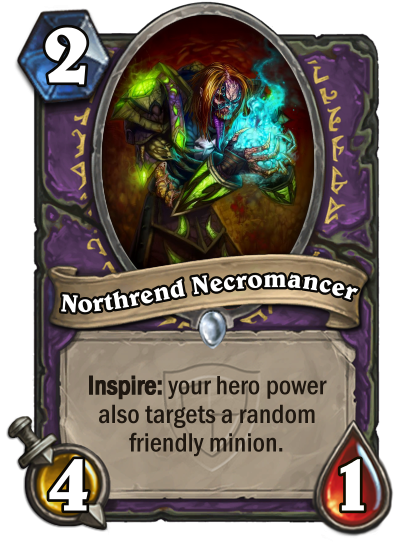 Requiring Battlecry/Deathrattle/Inspire/etc. 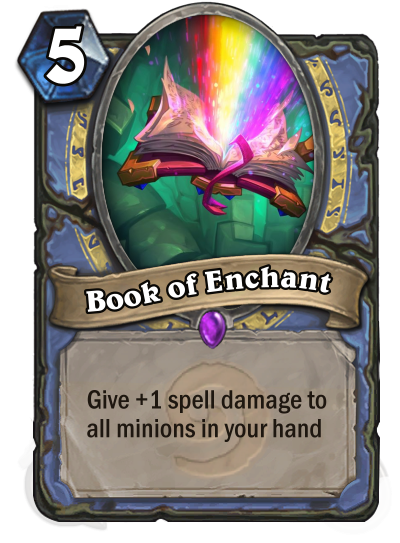 on a minion means you cannot put the same text on a spell and have it count. Inner Rage and Cruel Taskmaster do not have the exact same text. 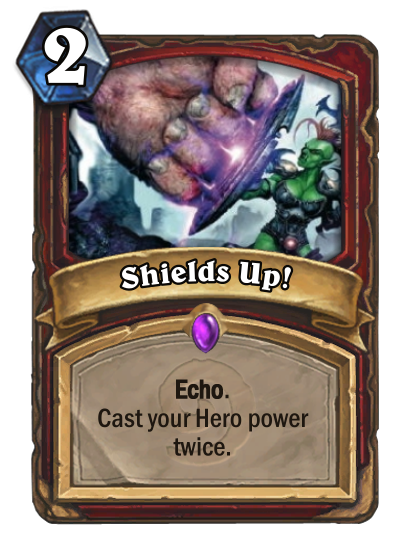 Hero cards are similarly banned, as the Hero Power keeps the card as a whole from being the same. 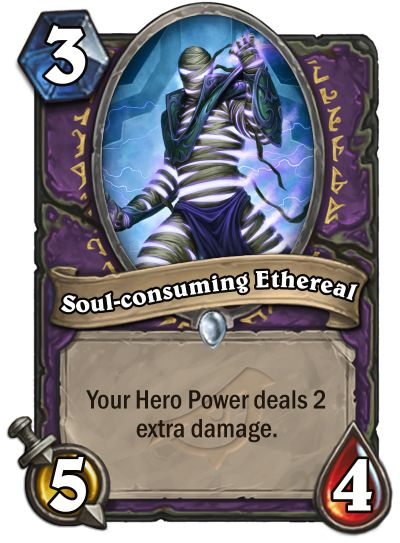 Existing examples include: Innervate and Counterfeit Coin , Bloodclaw and Pit Lord , Tyrantus and Air Elemental , Sorcerer's Apprentice and Radiant Elemental , King Krush and Kor'kron Elite . These are the rules that remain consistent from competition to competition. You are allowed to submit only one entry . 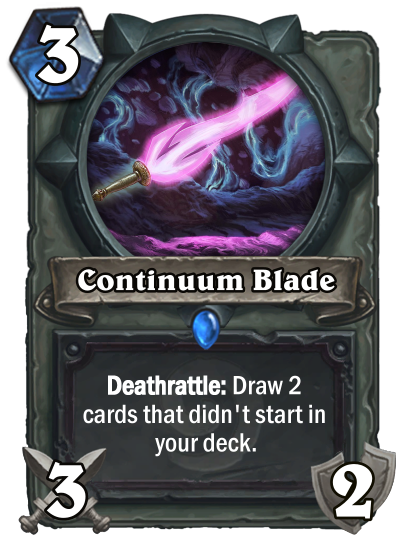 An entry normally consists of only one collectible card, plus any necessary additional material or commentary (explained below). You are allowed to post in this Submission Topic only once , only to submit your one entry. You may not delete ANY posts you make in this Submission Topic , not even accidental ones you may make over your one allowed, such as by double-posting or by accidentally posting something here that you meant for the Discussion Topic. If you do accidentally post more than once, inform any of the Fan Creation Forum moderators via PM, and we will handle it. Speaking of the Discussion Topic, that is where any discussion of this competition should go. This thread is for submissions only . If you want to discuss your card or ask questions about the competition rules or process, you can find a link to the Discussion Topic at the top of this thread. Plenty of folks there will be happy to help you out. Once you have submitted your one entry, you are allowed to make only minor changes to it. Minor changes are things like correcting typos or making balance changes that do not alter the spirit of your entry as determined by we the moderators. If you want to make any changes and have any doubts as to their legality, ask us first. Accompanying the image of your card, you may offer some minimal additional commentary to explain its design, balance, and/or other qualities. 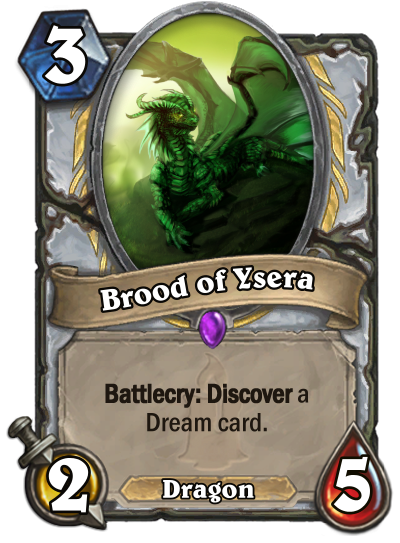 Flavor text is also welcome. 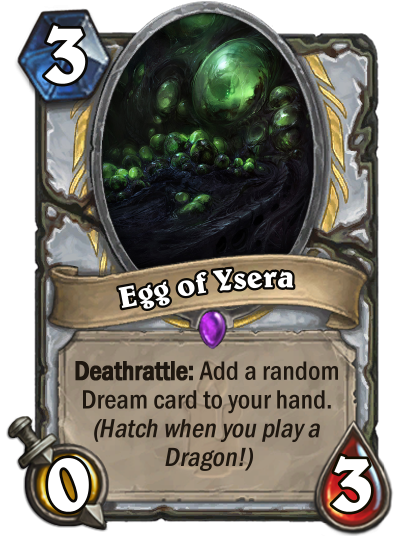 Your entry must be a card of your own creation . We've been doing this for a while, so if you blatantly rip off somebody else's idea, we will know. 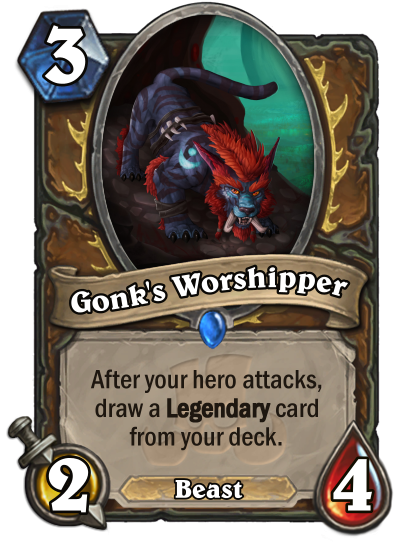 Remember that, although HearthCards is awesome, you MUST host your card somewhere other than Hearthcards. Save it and upload it to Imgur , Photobucket , or some other similar site. HearthCards has a limited server space and will purge cards after a few days, and nobody wants your card disappearing part-way through the finals. 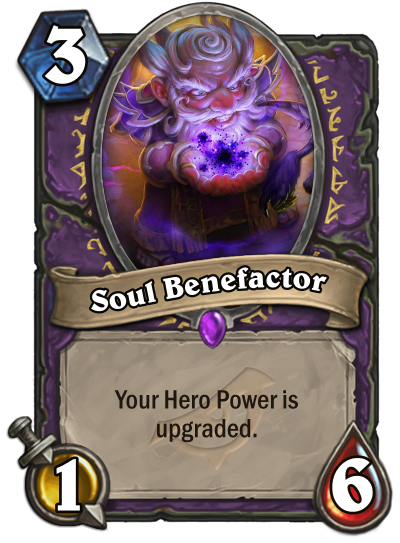 We understand that there are some HearthCards memberships that will allow you to save your card there for longer (and you should totally get one of those just for general fan creation purposes, by the way), but we don't know who has those memberships and we can't tell from the URLs. When you post your Imgur link, make sure it's the actual image and not the hosting page! You need to right-click and open the image in a new window/tab first; the link should have an "i" in front of it, "i.imgur.XXXX". 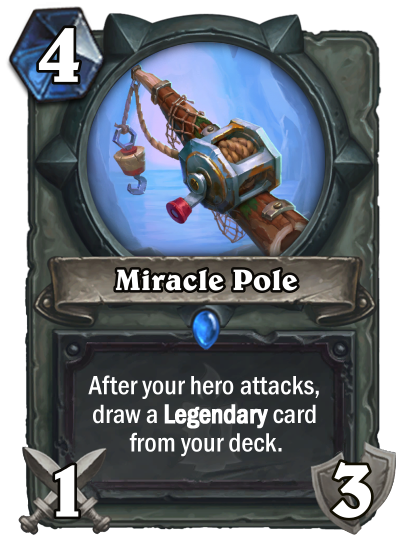 HearthPwn won't be able to direct-post your card, otherwise. Fun and even humorous entries are perfectly allowed, but "troll" entries will be disqualified. If you're worried that your card may be misinterpreted as a troll card, contact a moderator before you submit. 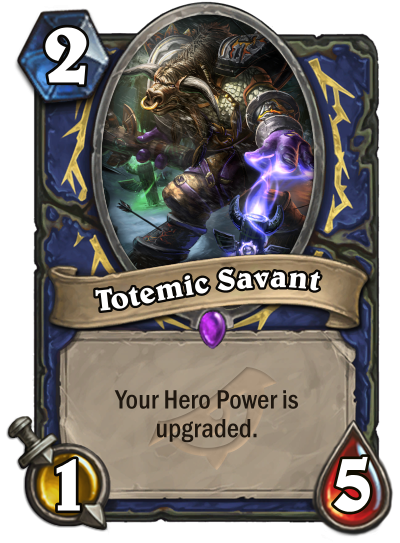 Emote-related cards will be considered a troll entry. We reserve the right to classify cards as "troll" entries as we deem necessary, even if the reasoning is not explicitly stated in the rules. A Note on Group Submissions: if you team up with other people to submit an entry, you must enclose that information in your submission and none of you may upvote that entry. That would be considered an unfair advantage and we will treat it as vote-manipulation. You are technically voting for yourself, and that is not allowed. Failing to tell us you're in a group is also against the rules, as we'll have no choice but to assume that you withheld the information to ghost-vote your group's submission. TIP: Though not a rule exactly, we highly recommend that you insert your images using this icon on the bar above the post text editor: . Just click that button and put in the URL of your image. Cards that are uploaded and attached to your post are not disallowed, but in our experience they will not do nearly as well, so this is for your own benefit more than anything. Finally, know that manipulating votes in any way is strictly forbidden. 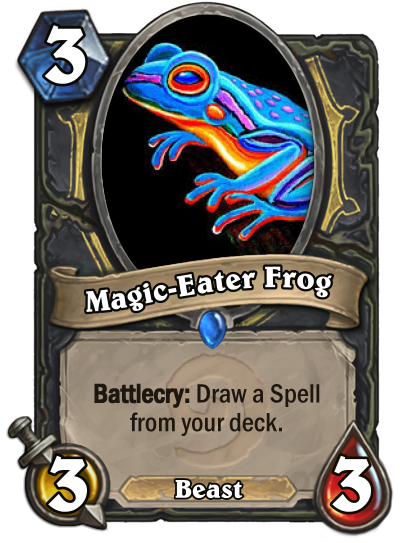 Any violators will receive an official warning, and will be banned from this and all future HearthPwn Card Design Competitions. During this Phase, the Discussion Topic is made available, previewing this week's competition theme. During this Phase, the Submission Topic is made available for your submissions. You may also, of course, feel free to give early up-votes to any submissions that you like! During this Phase, the Submission Topic will be locked, so no more entries may be submitted. Instead, use this time to browse the submissions and up-vote your favorites! During this Phase, the Discussion Topic will also be locked, and a new Poll Topic will go up. Discussion will be allowed to continue in the Poll Topic, and it will also include all the qualifying finalists and poll to decide the winner of the competition! a = The total number of submissions on the same page as the submission. b = The total number of up-votes that the submission received. c = The total number of up-votes on the same page as the submission. x = The submission's final score. 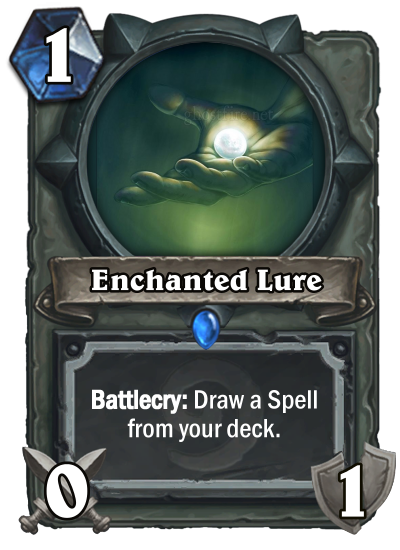 The formula basically measures which cards stood out the most, with the necessary assumption that each page is about equal in overall submission quality. It will be the entries that receive the highest final scores that move on to the Final Phase. The bottom line is that, although entries on the earlier pages of the Submission Topic are much more visible and thus receive many more up-votes than entries on later pages, you don't actually have to rush to get your entry in as soon as possible because the up-votes end up being weighted by what page your entry ends up on in order to determine its final score. But wait, there's more! 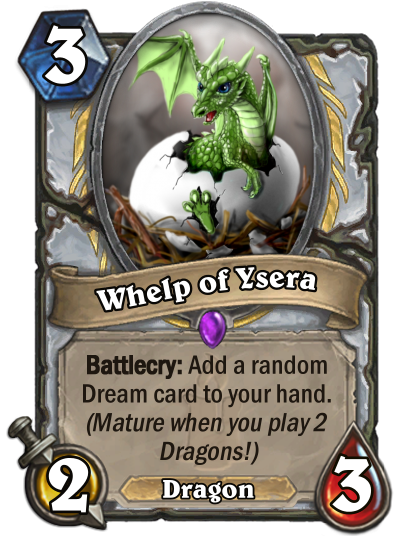 During each Weekly Card Design Competition, each Fan Creation Forum moderators will be given a Wild Card , which they can use to advance any one entry that they feel was initially overlooked or under-appreciated to the Final Phase, regardless of its final score. Wild Cards are our way of spicing things up a bit, but please don't ask to be given one or be upset if you aren't given one. These are just supposed to be fun. Their card forever immortalized in our Winners' Gallery ! They will be allowed to select the next card design competition theme. And a unique Avatar Border & " Card Design Champion " Title, as depicted below! Looking for more information about the WCDC or Fan Creations in general? Why not check out this FAQ to see if your question is answered there? You can also PM one of us Fan Creation Mods! I know not a lot of people like being on the first page but I'll get her going since I'm pretty happy with my cards overall. 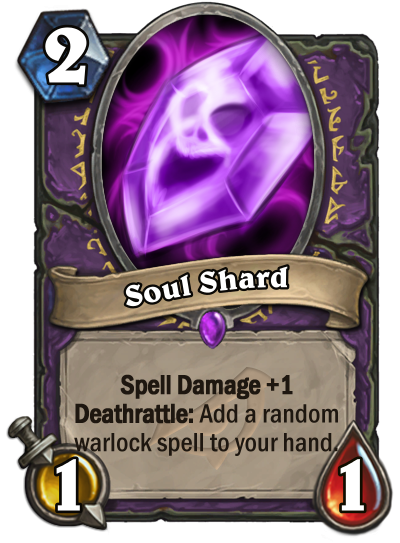 Soul Shards are one of the key currencies of casting warlock spells, so it's fitting that warlock spells are what they would strengthen and provide when "spent" as a deathrattle, giving some additional attention to a spellock kind of deck. 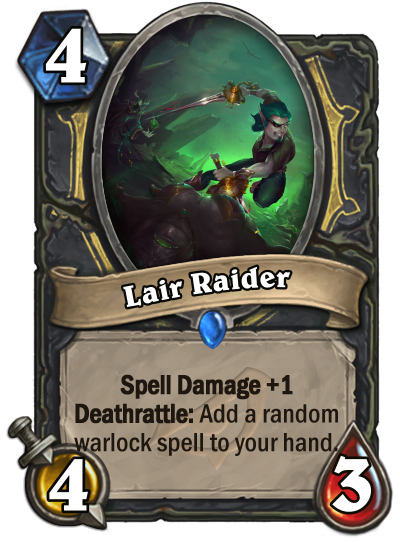 On the other hand, Lair Raider is a specific kind of thief card with something of a resemblance to Witch's Cauldron in that it allows a non-warlock access to a warlock spell. 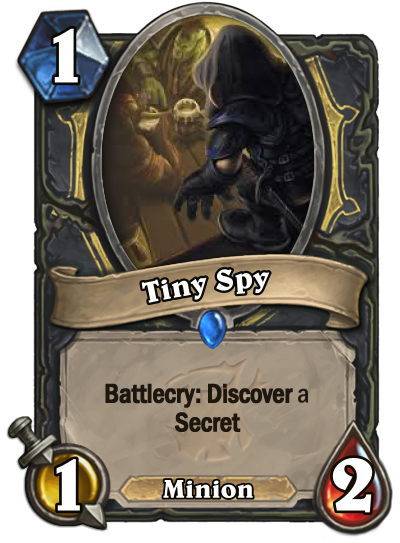 This kind of card allows a thief-style deck to still be somewhat viable, even when matched with another rogue, to get more value out of cards like Tess Greymane. 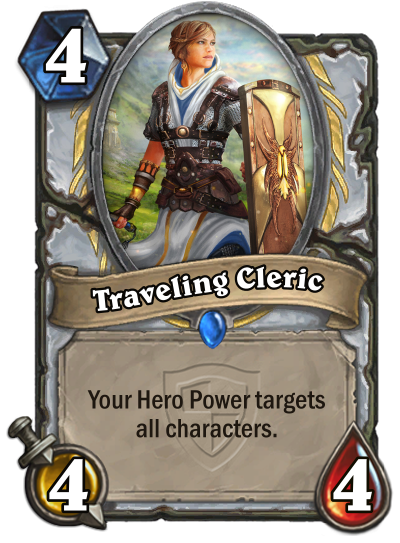 Multishot Huntress turns your Hunter's Hero Power into Baron Geddon , while Traveling Cleric provides the Priest an AoE heal. 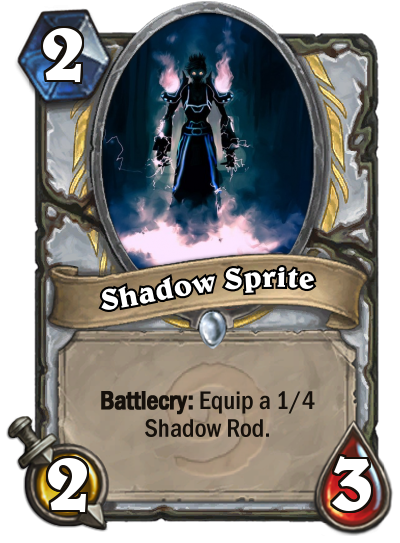 "Years later", it can be combined with Shadowreaper Anduin to create a similar outcome to the Hunter. 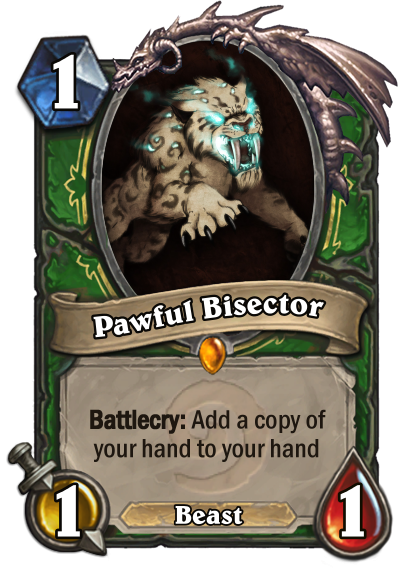 this provides beast synergy while not giving hunter another small beast to abuse and giving druids a good early game beast they can rely on. 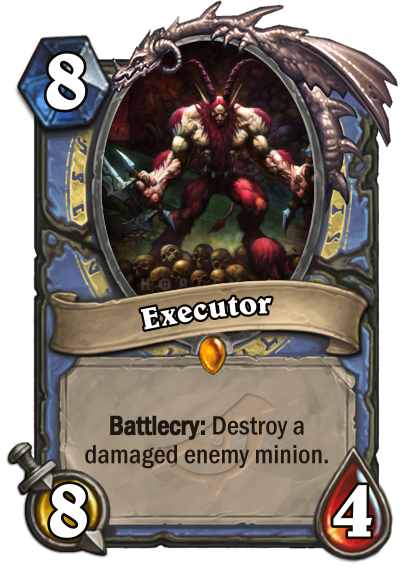 For a mage, offers powerful spells in form of a minion but the opponent can react to it and trigger the Deathrattle on their turn. 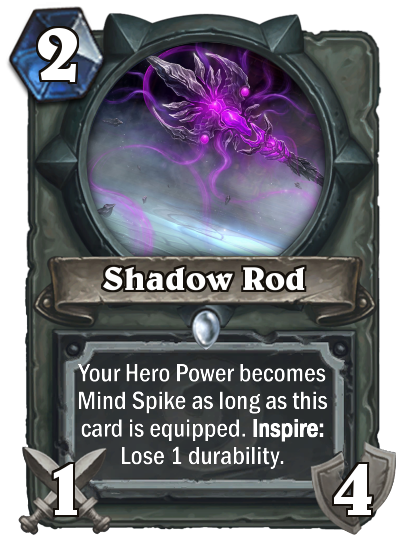 Weak to bounce, silence and transform effects. 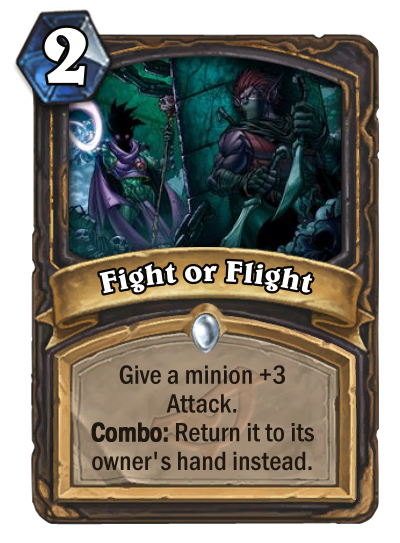 Rogue one offers weaker spells but the opponent is more forced to play around the spell unless they have an access to a weapon removal. Edit: improved the artwork. Added the italic font. 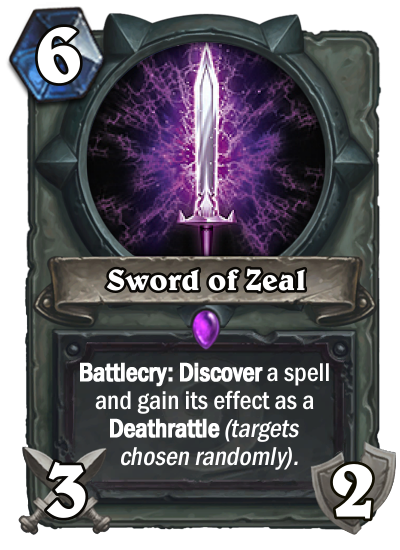 Sword of Zeal is a vanilla world drop that has a chance to grant its owner a burst of energy upon hitting an enemy. 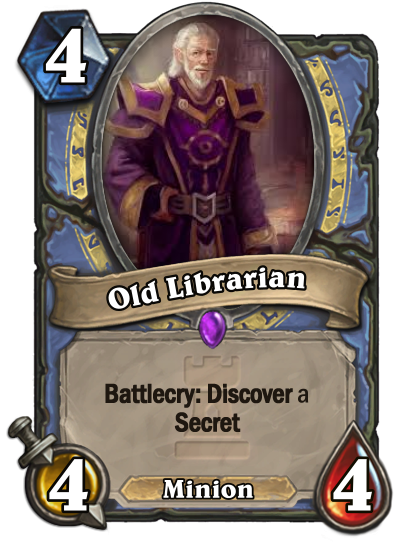 Ethereal Spellfilchers are infiltrators in Karazhan attempting to steal ancient knowledge from the old books. 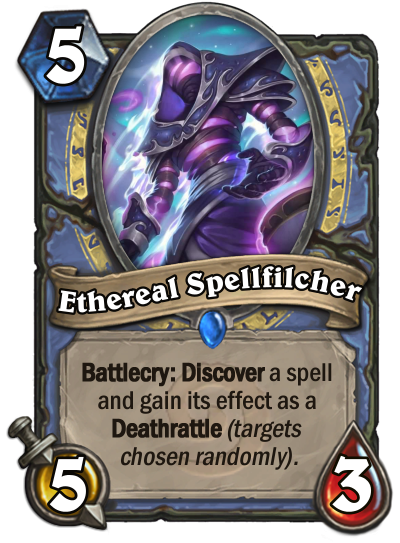 In combat, they have an ability called Spell Steal. Public Mod Note (linkblade91) : Under Review: We are looking for two class cards; Neutral is not allowed. 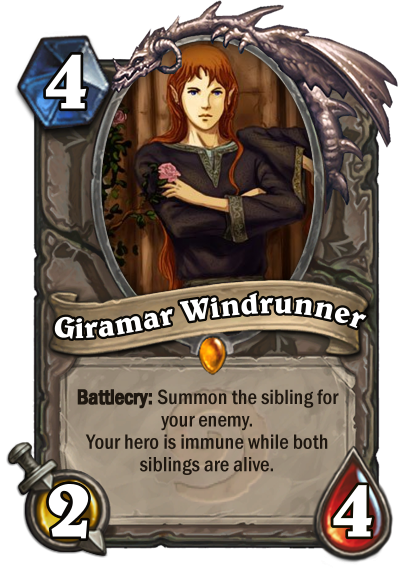 What could go better with the same battlecry if not siblings? 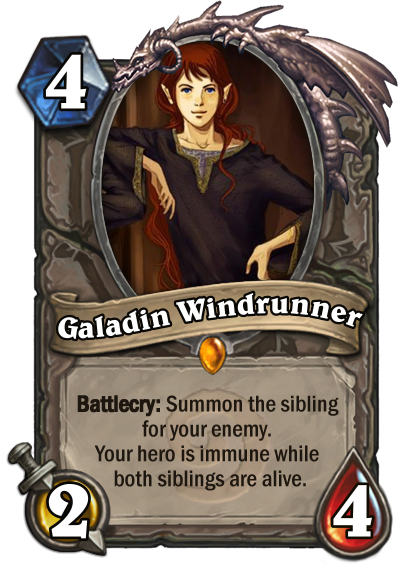 There could be some new interesting ways of deckbuilding if you want to keep your enemies brother/sister alive. Public Mod Note (linkblade91): Under Review: We are looking for two class cards; Neutral is not allowed. 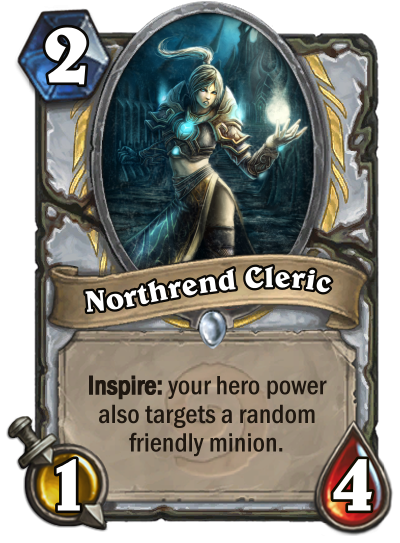 Both of these card encourage you to attack with your hero as much as possible. 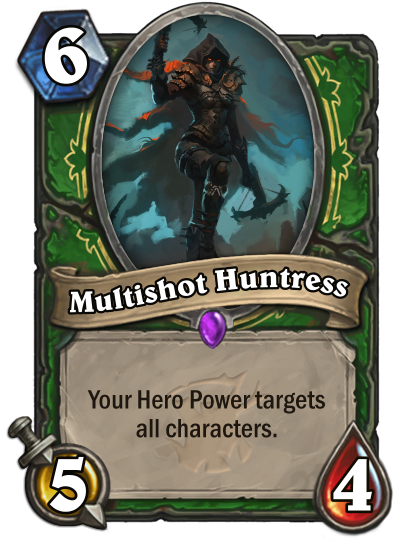 However, the cost of these card in Rogue and Druid are very different: Gonk's Worshipper force you to spend mana or card to get the effect while Rogue weapon force you not to Hero Power up, equip any weapon, a ton of health (which matter more in a class without healing unlike Druid) and has to stuck with a terrible 1/3 weapon that will not likely to kill anything. 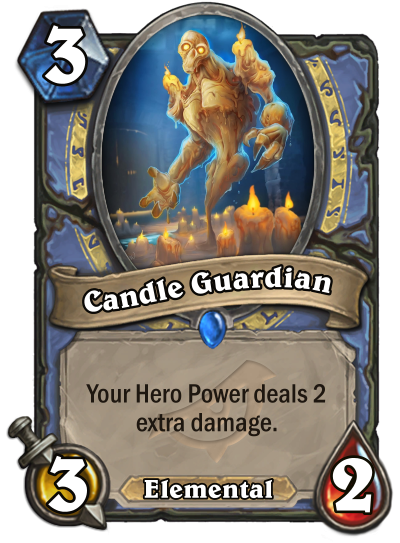 "Well, it seems Togwaggle wants more candle... Then he'll have to EARN it!" "I like your soul... I think I'll take it!" I came here. I saw restrictions. 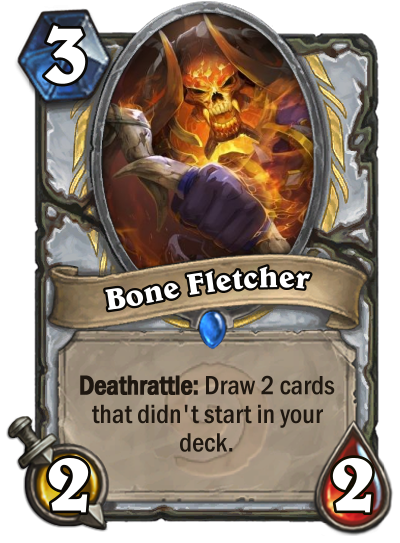 I saw "Requiring Battlecry/Deathrattle/Inspire/etc. 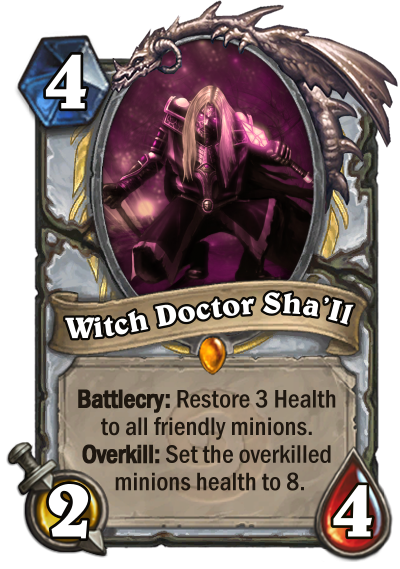 on a minion means you cannot put the same text on a spell and have it count". 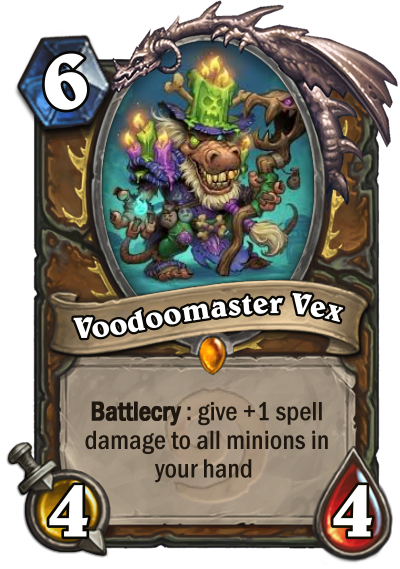 I asked myself: "Is it actualy possibly to make a spell and minion with the same card text"? At that moment I decided that I must make it. 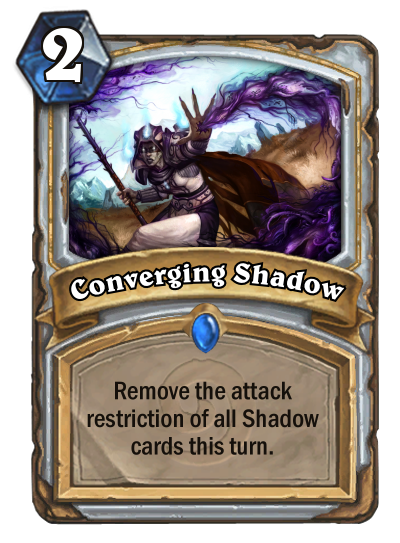 So here comes these two cards. 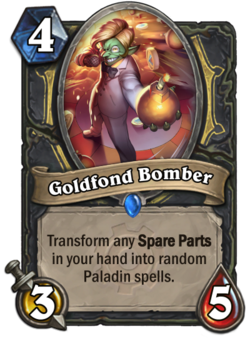 I decided to choose Paladin because many Spare Parts are buffs, and the same comes for Paladin spells. 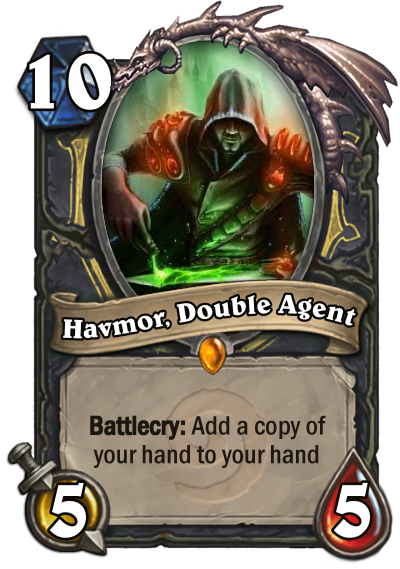 Then, the second card musted to be Rogue, where cards from other classes are in common. 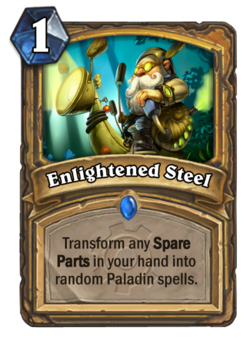 Clarification to cards: The first one transforms any Spare Parts you have in hand when you play it, while the second one also transforms them whenever you gain one. 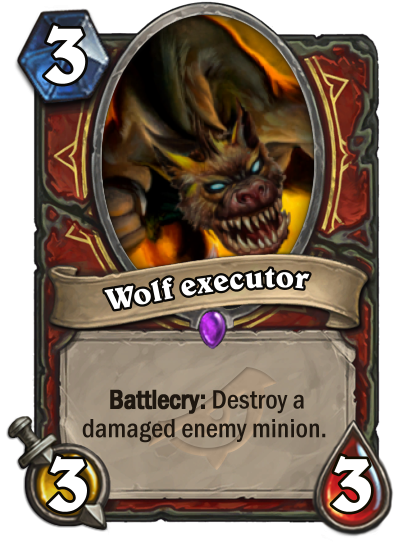 GL to all, I hope you like my idea! 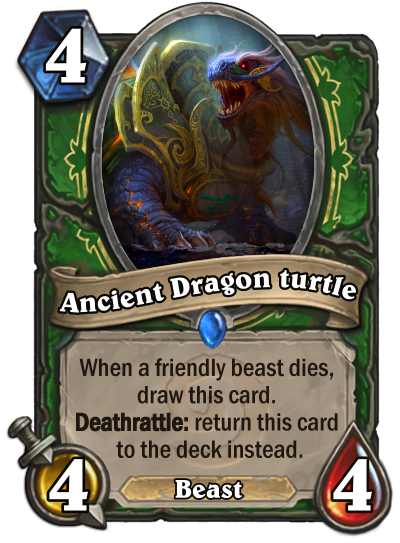 Vote for my card that is like whole deck in current Weekly Card Design Competition! Simple yet effective. 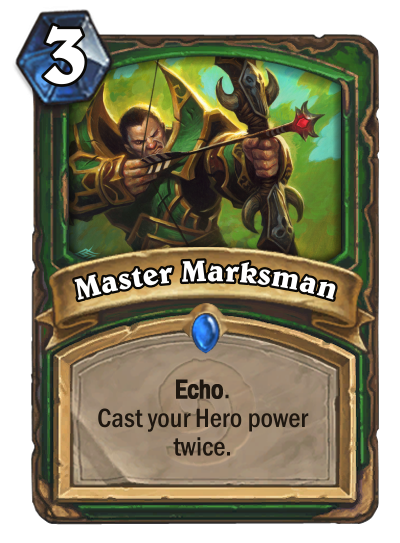 While both cards seem extremely powerful (especially Master Marksman in odd hunter), they both have a common drawback of losing your tempo, which I think will balance out the effectiveness of those card. 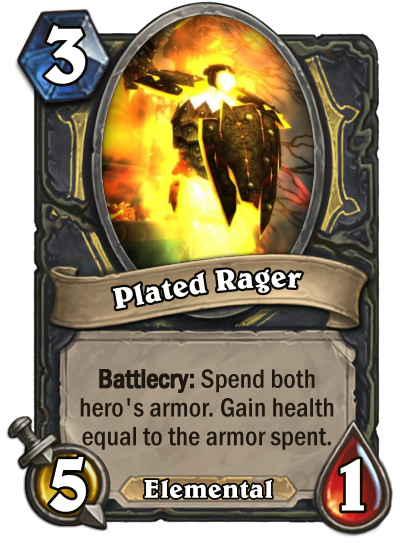 The idea is that Rogue can use this ability as a powerful armor hate card that is pretty useless otherwise (Sorry Magma Rager) but Warrior can use it to create a big threat to close out midrange games. What do you guys think? 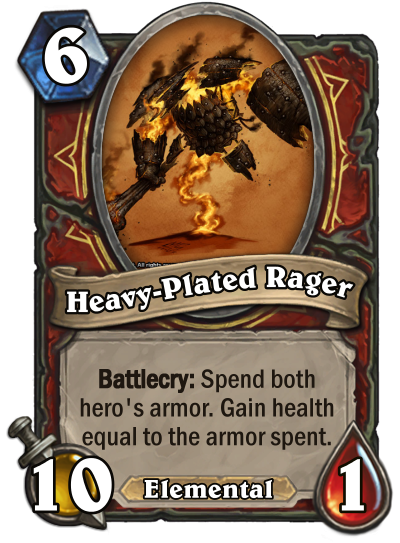 Is this too OP against armor classes or does the oppurtunity cost balance them? Public Mod Note (linkblade91) : Under Review: The "Battlecry" keeps the text from being exactly the same. Public Mod Note (linkblade91): Under Review: The "Battlecry" keeps the text from being exactly the same. 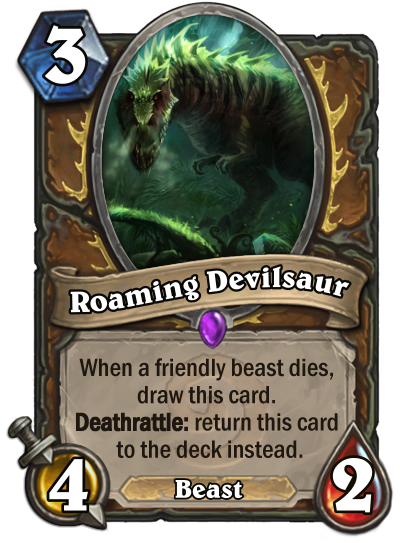 I'm not an expert at uploading to the forums, so the way I'm presenting my cards isn't perfect but please don't disqualify me.